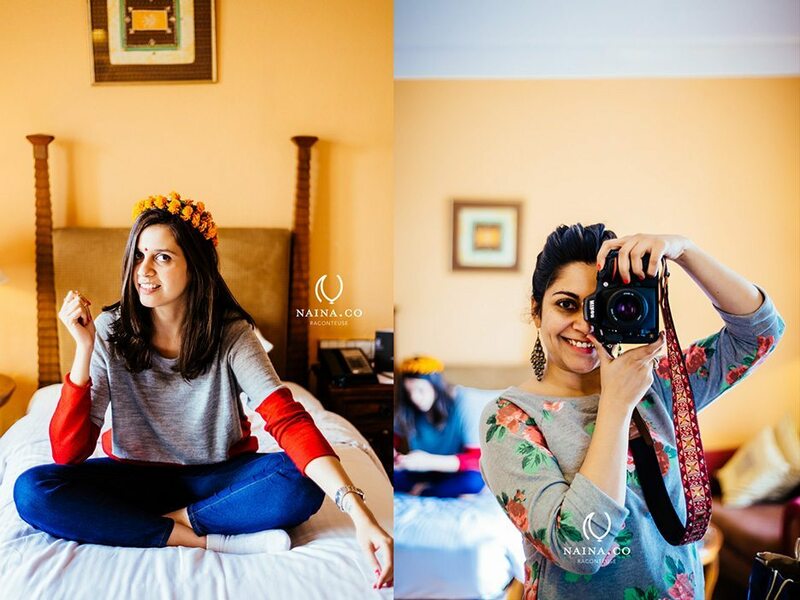 When Le Méridien got in touch with Akanksha and me about a quick visit to the Jaipur Literature Festival with a few days stay at the lovely Le Méridien, Jaipur property, we were very excited. Mainly because this would be our first time at the LitFest but also because this was the first time EVER that it was just us sisters together on a trip. Never too late right? We would also be attending the Writer’s Ball that Le Méridien was hosting for this year’s LitFest. Cold, foggy mornings meant we requested for an afternoon flight. even so, we did anticipate some delays and we were not disappointed. We hung out at the airport T3, with coffee and sandwiches. On our way to the hotel, Akanksha & I both rocked our Chanel sunglasses – we were thrilled there was *some* sun out. 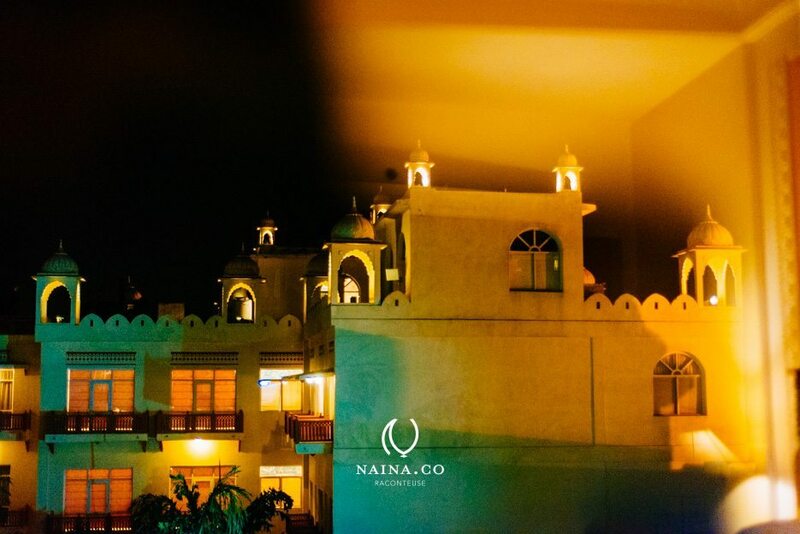 The Jaipur Le Méridien is a pretty hotel with traditional Rajashtani elements in one section and more modern ones in another. I’m a fan of the traditional beauty and preferred it over the modern aesthetic. Our room! It’s it beautiful? Especially with lovely sunlight streaming in through large balcony glass-doors, which I didn’t let Akanksha open because there were too many Pigeons outside – with a lot of pigeon-poop. Watching television while on vacation is not a priority but what else to do when lazing in your comfy room? Alas only 32 channels – I forget I live in the capital city of Delhi where I take a lot of things for granted. Jaipur is still giving out more of a small-town vibe. More on that in the upcoming stories about the two additional days we were at the LitFest. Give me a bathtub any day of the year and you will find me there. It would have been nice to have some bath oil / bath salts but when those are not available, I pour my bath gel or even the shampoo in a tub of steaming hot water and soak for a bit. These were the views from our balcony glass doors. Beautiful colors. We finally made it onto our beds and I think it’s easy to tell that we were two happy bunnies! ( I was and still am running a bit of a cold, which appears to be a little more severe than I’d initially assumed so if you see any photos of me not showing my entire set of teeth, I’m probably cranky with blowing my nose more than I’d like to. ) I’m still learning the art of mirror selfies. These beautiful wood frames lined the hotel’s corridors. Simple and elegant and they add an air of old-world charm to the walls. Onto a bit of food now – at the Latest Recipe restaurant. We both love salmon so it was Salmon steak and an open-faced salmon sandwich. The salmon on the steak was strangely very chewy – I requested the Chef for a replacement and the replacement was delightful. Thank you Chef Dhaliwal & Chef Soumitra for taking care of us! For dessert, I’d asked for a coconut based thing and while what was on the menu was unfortunately out of stock, Check Dhaliwal got me a replacement! Yay! Warm coconut mini-cakes. Over the course of three days, we ate all our meals at Latest Recipe and even the Writer’s Ball was held at the same space on two levels. It would be safe to say that after our hotel room, this was our favorite space at the hotel. After our very late lunch, Akanksha and I took off for a walk outside to look at the lights. Hotels are usually beautifully lit at night and I didn’t want to miss an invigorating cold weather walk. With my camera because we had no idea how the fog would treat us over the next two days. Isn’t is beautiful? Of course it got cold really quickly, so we headed back to our room. Above, on the left, this is what is inside the lift and on the right is what was right outside the lift. And there was more inside the lift – see below? Hehe. Monkeys, headed back to the room. Pigeons taking refuge on our very well-lit balcony and the view at night from our room. Of course, both Akanksha and I took a lot of photographs – no better way to convey what the space looked and felt like. While our initial goal was to do one comprehensive story / blog post, we’re both now doing three. You can find Akanksha’s story on her blog from her point of view. The advantages of her having published the story before I did is that I conveniently get to copy all the links from her post without having to look for them myself.